2011-10-02 - Robert L. Miller DR, Columbia, KY - Photo by Ed Waggener. Sheena London, a member of the residence hall staff at Lindsey Wilson College, is in charge of traffic control at the Robert L. Miller Drive entrance to Blue Raider Stadium. 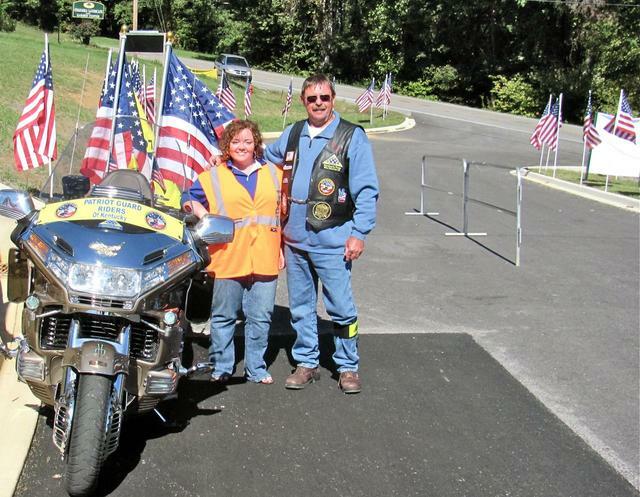 She's pictured with David England, Winchester, KY, who was in Columbia with one of the earliest waves Patriot Guard Riders (PGR), helping line the procession path along which Adair County native Dakota Meyer, Congressional Medal of Honor winner will ride. London, from Hiseville, KY, is a graduate of Lindsey Wilson College. England said that he expects as many as 400 riders today. The number is growing in part because of the absolutely perfect October 2, 2011 Day. Parking for dignitaries and others taking part in the ceremony will take much of the Miller Park capacity, but clearly marked empty lots along Russell Road and Jamestown Street are available for the overflow, and shuttle busses will be carrying spectators to Blue Raider Stadium, 820 Hanley Lane, for the 2pmCT main ceremonies.